Heroin is one of the most deadly and addictive street drugs destroying an untold number of lives in the United States. Heroin is part of the opioid class of drugs, deriving from morphine, the same as prescription drugs such as Vicodin and Fentanyl. The rise in prescription opioid abuse has also contributed to an increase in heroin addiction. Prescription opioid use is the single most significant risk factor for heroin addiction. Currently, half of those who abuse heroin also abuse prescription opioids. Since 2007, overdose deaths from heroin have increased five-fold. Heroin can be snorted, injected, or smoked. It comes in a powder or tar-like form. 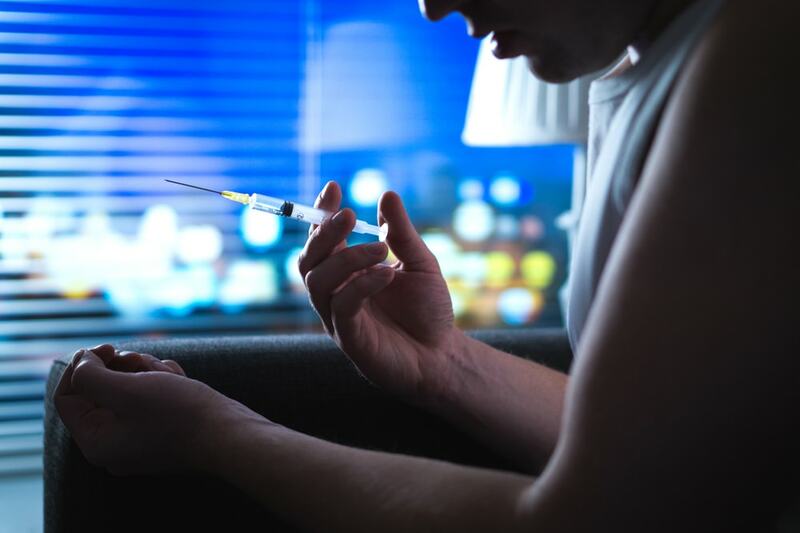 Since injection is the most common method used to get high, heroin abusers are at risk of developing chronic, deadly diseases from intravenous drug use. Dirty needles can spread HIV and hepatitis. Even if someone manages to have a successful heroin withdrawal, get, and stay clean from heroin, they may suffer severe and life-long health complications from their drug use. It’s crucial that people who find themselves addicted to heroin get help immediately to prevent overdose and lifelong disease. Heroin and other opioid drugs bind to the opiate receptors in the brain. The drug induces feelings of euphoria and suppresses the respiratory rate. Since heroin is a street drug, it is often laced with other dangerous chemicals. Drug dealers aren’t chemists and will mix and cut heroin indiscriminately with unknown substances. People who are addicted and get these ‘bad batches’ will die in droves in the cities and towns where the bad batch is being sold. Because of the way heroin binds to important neurotransmitters in the brain, it is incredibly difficult to quit. In 2015, the new ‘Secretary’s Opioid Initiative’ from the Secretary of Health and Human Services announced a program to address heroin and opioid abuse and addiction. Part of the initiative included increasing access to medically assisted detox centers and rehabilitation facilities. Heroin and opioids’ highly addictive qualities make it far too easy for those in recovery to relapse, and because heroin is cut with deadly, unknown chemicals, these people are at high-risk of overdosing and dying. Fortunately, there are medical facilities and rehab centers that are equipped to help people get and stay clean. Detox centers can give patients access to life-saving replacement drugs which act to calm the activated opioid receptors, alleviate withdrawal symptoms, and decrease occasional cravings once someone manages to quit heroin. What is the timeline for heroin withdrawal? Heroin withdrawals start between 6 and 12 hours after the last dose. Within 1 to 3 days, they peak. After about a week to ten days, heroin withdrawal symptoms will begin to subside. But, emotional symptoms can linger for months or years after cessation. Cravings can last for many months after the last dose, but people who get assistance from medical detox centers can take replacement drugs like methadone to alleviate cravings and prevent relapse. What are the physical symptoms and complications of heroin withdrawal? What emotional and psychological issues occur during withdrawal? What is the difference between a cold-turkey detox and a medical detox from heroin? A cold-turkey detox implies a sudden cessation from heroin either at home or in jail; anywhere but under medical supervision. Abrupt cessation is painful, and in extreme cases, can kill someone. In a medical detox center, patients are kept in a safe and serene environment where they can be adequately monitored and treated for uncomfortable and potentially deadly withdrawal symptoms. Also, doctors are on-call 24/7 to help patients and prescribe safe, legal drugs that can shorten the duration and intensity of withdrawal symptoms. What is safe to take during heroin detox? Patients can take replacement opioid drugs such as methadone during the detox process. Also, doctors can give patients short-term sleep aids for insomnia, beta blockers for high blood pressure and cardiac issues, and antidepressants for depression and anxiety. What isn’t safe to take during heroin detox? It’s never safe for someone to endure detox alone and without medical care. Serious complications can result and people who quit taking heroin tend to plunge into a deep depression or experience distressing anxiety attacks. People who try to quit any drug on their own start the process with determination and optimism. But, withdrawal symptoms are scary, painful, and can take a long time to subside. Most find themselves retaking the drug to alleviate their distress if they aren’t in a secure environment. Going to a medical detox center can eliminate the risk of relapse or complications from withdrawals. Patients’ physical and mental health is assessed in a detox center. A team of doctors, counselors, and social workers are assigned to the patient, where they work together to formulate a treatment method that is tailored to the individual. As is often the case with drug addiction, patients often present with a host of health problems. Drugs suppress appetite and immune functioning, and patients often need a lot of care when they first attend drug rehab. By going to a medical detox facility, patients can get the attention they need for underlying mental and physical health problems. During the withdrawal process, patients are given replacement drugs to lessen their withdrawal symptoms and cravings for heroin. When they start to experience painful symptoms, doctors are readily available to help them. Also, therapists help patients work through the emotional and psychological issues of drug addiction to help them learn how to live a drug-free life. In over 50% of drug addictions, patients are self-medicating emotional and mental health problems. During the withdrawal process, therapists can address and treat these issues to prevent the patient from relapsing. How is heroin withdrawal different from other drugs in the opioid class? Heroin addictions bind to the same opioid receptors in the brain as other opioid drugs. The symptoms and overall withdrawal process are the same as prescription opioids. Replacement medications have greatly helped people with heroin addictions and prescription opiate addictions. How are people affected differently from heroin withdrawal? A person’s age, weight, and metabolic rate can help or hinder the withdrawal process. Also, people with complex medical histories and who have been addicted for a long time or who abuse multiple drugs will have a more difficult time during the withdrawal process. But, regardless of their history, anyone who wants to quit heroin can do so safely in a medical detox center.